We want you to be a part of something bigger! On August 21, 2017, the IU College of Arts and Sciences and the IU Council for Arts and Humanities will host an event for IU students, faculty and staff at the Conrad Prebys Amphitheater just west of Bryan House. Numerous IU departments and organizations will be on hand to celebrate the partial solar eclipse and will offer activities, demonstrations, and safety information. Join us from 1 to 4 pm for an afternoon of educational fun. We will provide 10,000 pairs of free solar eclipse viewing cards at First Year Experience Guide Tables and at the Conrad Prebys Amphitheater on a first come, first serve basis. We will also offer suggestions about how to safely view the eclipse indirectly. Let's safely view this phenomenon together! Please follow the link below and get reminders from the IU Bloomington Office of the Provost about the event. Click below for more resources for throwing your own solar eclipse celebration! Are you hosting a public viewing party or event? If yes, register your event with us and we'll add you to our map. We want the general public to find a place local to them to view safely. Space themes will be featured at story time and other children's and youth activities. Get into the spirit of the eclipse with Chicken Little. Children in grades K through 6th will learn about the upcoming solar eclipse by attending our eclipse education programs! Children’s Program Specialist Hope Tauber will present eclipse and fun space facts! Children will play space bingo for prizes, make pinhole constellation viewers, have straw rocket contests, and everyone will get eclipse viewing glasses to use on the Monday, August 21st! This afternoon program is free and open to children of all abilities entering K through 6. Please contact Lake Village at (219) 992-3490, Roselawn at (219) 345-2010, or Morocco at (219) 285-2664 to sign up for this engaging program! In preparation for the solar eclipse, a representative from the Fort Wayne Astronomical Society will share the science behind the upcoming eclipse, as well as safe viewing tips. Children of all ages and families are invited to create solar eclipse related crafts, learn about the eclipse through stories, and enjoy other fun such as eclipse related activities and snacks. Come learn about visible events in the sky, and do activities for the solar eclipse! Solar eclipse viewing glasses will be available starting at noon, and the local Lions Club will have ice cream available! Come watch a live-stream of the NASA EDGE footage! Live-streaming of the total eclipse, thanks to NASA! Eclipse viewing glasses will be provided, enjoy a variety of activities. There will be eclipse-related activities all day including safe viewing information and distribution of solar eclipse viewing glasses. Fairmount Public Library will be showing a live-stream of the eclipse, and will start handing out solar eclipse viewing glasses on August 1. Registration required, opens August 7. All ages are invited to join the Crown Point Community Library in experiencing the 2017 solar eclipse! View the once-in-a-lifetime solar eclipse with your friends at the Library! Learn about safely viewing the solar eclipse and watch as we reach near totality. We will be set up at Central Park in downtown Elkhart and Library staff will be on hand to answer questions about this exciting celestial event. All who come will receive a free pair of solar viewing glasses. Come watch the Solar Eclipse with your friends and neighbors with the Muncie Public Library and the Muncie Astronomy Club. Learn why eclipses happen and how to look at a solar eclipse safely. Free eye protection will be provided by the Space Science Institute while supplies last. The Muncie Astronomy Club will also be bringing solar telescopes for people to use before the eclipse. Pack a lunch and bring a picnic blanket or chairs! Weather permitting, we will be watching The Great American Eclipse in the green space behind Maring-Hunt and Kennedy libraries. A livestream from an area seeing the total eclipse will be available in the meeting rooms at both locations. Get a free pair of NASA solar eclipse glasses and a sno-cone when you join us outside the library's north entrance to watch this celestial event. All ages welcome. All ages welcome! Brief informative program. Free safe viewing glasses available. For the first time since 1979, you can see a total solar eclipse. Come learn the science behind the solar eclipse and watch it happen in real time. Free viewing glasses provided. The viewing party will be held in the gazebo at the town park across the street from the library. Bring your blankets or lawn chairs and the eclipse viewing glasses you received at the South Whitley Community Public Library! A live stream of the event will be held in the library’s Meeting Room A as well. Space-themed snacks will be available. While the town of Ligonier is not in the direct viewing area for the eclipse, the town should experience 80-90% coverage of the sun from the solar eclipse. The library has been granted special solar eclipse glasses through a partnership with NASA, NCIL, and the American Library Association. Along with other libraries throughout the nation, the library will be hosting a special viewing party from 1:00-3:45. The prime viewing time will be approximately 2:22 p.m. The library will have a limited number of glasses to give away and snacks will be provided. Homeschool families, parents with children ages 3 and up, and any adults who wish to view the eclipse safely are invited. Each library will have eclipse viewing glasses for our guests, handouts about this event, and refreshments. Guests are asked to bring their own lawn chairs, but registration is not necessary for this program – simply plan to visit Lake Village, Morocco or Roselawn Libraries to experience this once-in-a-lifetime event! Westfield Washington Public Library is hosting a solar eclipse viewing party at the Washington Townships' MacGregor Park, and will have solar eclipse viewing glasses available. Come enjoy an eclipse themed party with snacks, refreshments and a door prize. Eclipse viewing glasses will be provided while quantities last. Bring a lawn chair or blanket and a hat for outside viewing. We will have a live stream of the eclipse from NASA in case of inclement weather. Astronomer Mark Steven Williams of StarGeezer Astronomy will present a program detailing the local circumstances of the Great American Eclipse in Harrison County Indiana and will explain how to safely view the eclipse. The programs will start outdoors with a demonstraction of simple observing tools including a pinhole camera and a specially outfitted telescope called a "Sun Funnel." Activities will then move indoors for a PowerPoint presentation that will cover the eclipse and "What's Up" coming celestial highlights. Join John Sheperd, Senior Astronomer at the Link Observatory in Mooresville, as he shares about the spectacular solar eclipse, happening August 21, 2017. Learn about safe ways to view the eclipse and recieve free safe eclipse-watching glasses. On August 4th and 18th, the solar eclipse and eye care will be featured in programming. First 100 visitors will get free viewing glasses. Also, Link Observatory will bring the Hydrogen-Alpha Solar Telescope, which will let visitors view the sun without damaging their eyes. Solar eclipse viewing glasses will be provided. Learn about this phenomenal celestial event and then observe it with special eclipse-watching glasses as it occurs from 1:00 to 3:50 pm. Bring a lawn chair or blanket and a hat for outside viewing comfort. In case of inclement weather, we will watch a live feed of the eclipse inside. A Solar Eclipse, Oh My! See the astronomical event of the decade: a solar eclipse! We'll provide the eclipse safe-glasses so you don't have to miss out on the action. Celebrate this extraordinary eclipse with crafts and stories while you wait for the main event. Refreshments and solar eclipse viewing glasses will be provided at this viewing party. Get your shades on and celebrate! Come learn about safe viewing of the eclipse, and watch the event in the library park! Local group, Elements of Jazz, will be providing music for the viewing party. Solar eclipse viewing glasses will be available at the event. Oakland City Columbia Twp.Public Library will have a live-stream of the total eclipse from NASA playing inside, and will all step out to view the partial eclipse from the library. Batesville Public Library will hand out solar eclipse viewing glasses and set up an 8" Dobsonian telescope, with a solar filter, set up outside the library for some closer eclipse viewing. Join us to learn more about the full solar eclipse that is occurring on August 21, 2017. This total eclipse of the sun is the first since 1776 whose path of totality — the narrow corridor where observers will be in the moon’s shadow as it covers the sun — lies completely within the continental United States and no other country. The path will bring this eclipse close to Danville with full eclipse viewing only a few hours away. Amateur astronomer and Adult Services Librarian, Mindy Tuceryan will be giving some tips on safe viewing of the partial eclipse that will be visible in Danville and other astronomical tid-bits. Materials for safe viewing of the eclipse will also be distributed. Register now. Glasses and the libraries' Dobsonian Telescope with solar lens received through the Young Galileo's grant from the Cincinnati Observatory will be available for viewing the eclipse safely. The whole community is invited to participate with our students from all four schools in the Mitchell Community School Corporation. A live stream will be available in the lobby from 12:45 to 4. Solar eclipse glasses will be handed out for those who would like to safely view the eclipse from outside. Then space documentaries will be shown from 4:30 to 8. Each branch will host a solar eclipse viewing party. On August 21st a spectacular total eclipse of the Sun will be visible across parts of the continental United States. We will be collaborating with 6th grade teacher Mrs. Heidlage to provide materials to students and teachers for eclipse education and safe viewing techniques. We are also able to provide viewing glasses to each student and staff member through a grant provided by the Space Science Institute. The next time you get to see the moon block out the sun in Indiana is 2024! Borrow a pair of eclipse glasses near the Sycamore Shelter to see this! Totality is around 2:20. The Digital Dome theater will open up to the community at 3 pm, and there will be a presentation during the day and a variety of eclipse crafts and activities. Safety glasses will be provided to safely view the eclipse. School is still out, so experience the event with us! 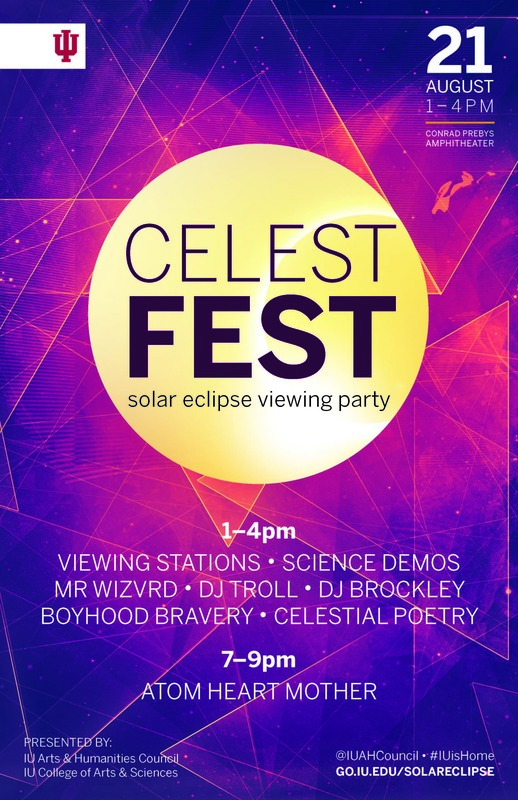 Food, games, free viewing glasses, and of course, the eclipse! The event is outside, so bring sunscreen, blankets/chairs, and whatever else you might need. Peak viewing time is a little after 2:30 pm. Programs will include information about solar eclipses and how to view them safely. There will be treats, activities, and solar eclipse glasses available. Please register by calling (419) 547 - 7174.